Enjoy the comfort of radiant heated floors. As consumers search for more efficient home heating systems, increasing numbers of people are turning to underfloor heating. 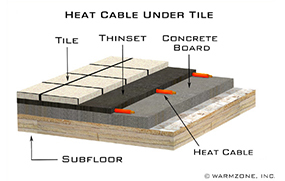 Electric floor warming systems are the most effective radiant floor heating systems available, and can be easily installed under tile, carpet, vinyl and hardwood floors to provide safe and evenly distributed heat. Recent technological advancements and affordable pricing have made underfloor heating systems a luxurious, yet realistic heating solution for homeowners today. Warmzone underfloor heating systems feature a programmable thermostat so you can program the floors to warm just moments before you wake up in the morning and only at times when you need. Radiant underfloor heating systems are virtually maintenance free and surprisingly easy to install. In addition to the popularity of residential underfloor heating, radiant floor heating systems are commonly installed in large commercial properties. Electric floor heating systems have proven ideal as cost-effective heating solutions for small, custom sized bathrooms, and kitchens to large office areas and hallways. While hydronic floor warming systems are also an option for consumers, the benefits of electric floor heating typically outweigh those of hydronic floor heating. 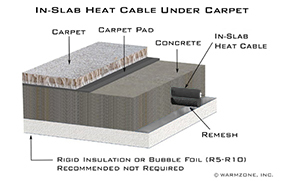 Electric underfloor heating cable systems distribute heat more efficiently, are easy to install and less expensive. The electric systems are virtually maintenance free and provide an extremely quick response time. Each unit is controlled by a small thermostat that is attached to an in-floor sensor. Traditional heating systems are relatively inefficient when compared to radiant floor warming. The systems heat only the air, which rises to the top of the room. Underfloor heating systems distribute comfortable warmth evenly across the floor, allowing heat to rise and generate consistent warmth for the room. In-floor radiant heating is an energy-efficient way to provide warmth and comfort for your home. Electric radiant heating systems generate heat that rises from the floor, helping to create a warm, luxurious environment within the walls of your home or office. 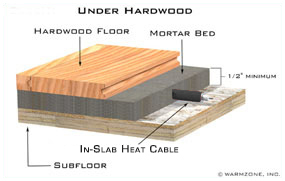 Underfloor radiant heating systems are easy to customize and can be applied to a wide variety of floor surfaces, including hardwood, laminates, tile, carpet, etc.